Oliver Holmes has signed a two-year contract extension with Castleford Tigers, keeping him at the Super League club until the end of 2016. His existing deal was due to run out at the end of the season. Despite being just 21, Holmes has already made 73 league appearances for the Tigers since making his debut as a 17-year-old in April 2010. Head coach Daryl Powell said: "Oliver is a quality player and individual whose game is growing consistently." 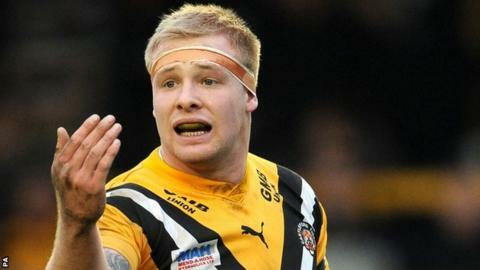 Holmes, who graduated through the Tigers Academy after joining from his amateur club Normanton Knights, has scored two tries in nine appearances for the Tigers this season. "I'm happy with how I'm playing and that shows by being rewarded with the new contract," Holmes said. The back-rower added: "It's a little bit odd because, a couple of years ago, there were a lot of players who came through the academy and had to step up to the senior side quite early at 17 and 18-years-old because we didn't have a big squad. "We benefitted in that situation and I'd like to say that I'm quite experienced now. There are still bits of my game that I'm looking to improve and that's what I'll be working on in training."